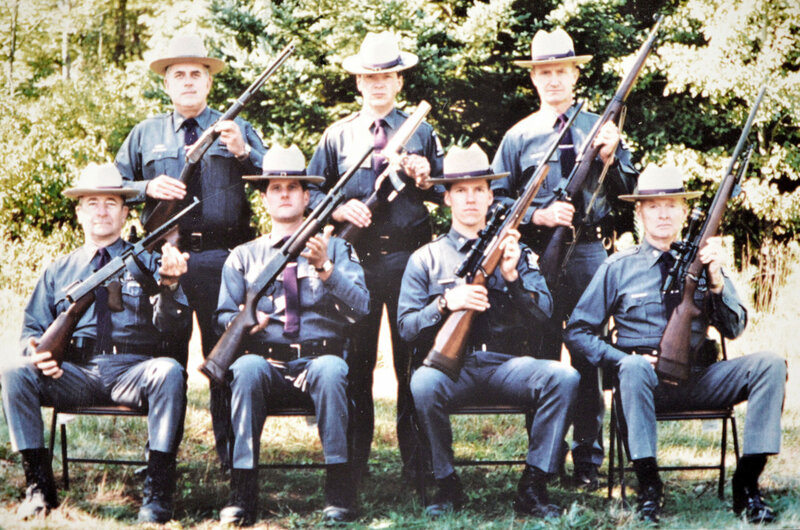 Troop G Members display shoulder firearms used by the NYSP over the years since 1917. The weapons shown are shown in the order they were adopted by the Division. Back row- (L to R). Zone Sergeant John Lustyik with Winchester model 1894 lever action .30-30 carbine adopted in 1917, Trooper Michael D’ Allaird with Mark I tear gas gun adopted 1929, and Sergeant Edwin Belles with Enfield model 1917 bolt-action 30.06 rifle adopted 1938. Front Row-(L to R). Trooper Philip Gould with Thompson sub-machine gun model 1928 .45 caliber adopted 1940, Trooper Herbert Frank with Ithaca model 37 pump- action 12 gauge shotgun adopted 1963, Trooper Kurt Schafsteck with Winchester model 701 bolt-action .270 caliber rifle adopted 1965, and Trooper Alexander Macpherson with Remington model 700 bolt- action .308 caliber rifle adopted 1988.